An Oasis in Your Home. Fine Rugs Make Home More Relaxing. "...Area rugs can tie in furniture to help create a focal point and unity. The idea is to create a space that looks and feels softer, calmer and more relaxing. Layering soft textures can create this effect ...". A well-chosen rug offers a "nice welcome home". Your rug becomes a gathering place: an oasis in the midst of your home. When you consider all that happens around it over the course of time, a fine rug takes on sentimental attributes: "a place where..." . Here's more evidence that a fine rug is not "just a rug", and offers its owner much more than a mere floor covering. This isn't the immediate goal for every rug buyer of course, but it CAN BE a long term bonus for owning a well-chosen rug. Exquisite handwoven carpet is more than 360 years old. Was bought by industrialist William Clark in Paris in early 1900s. 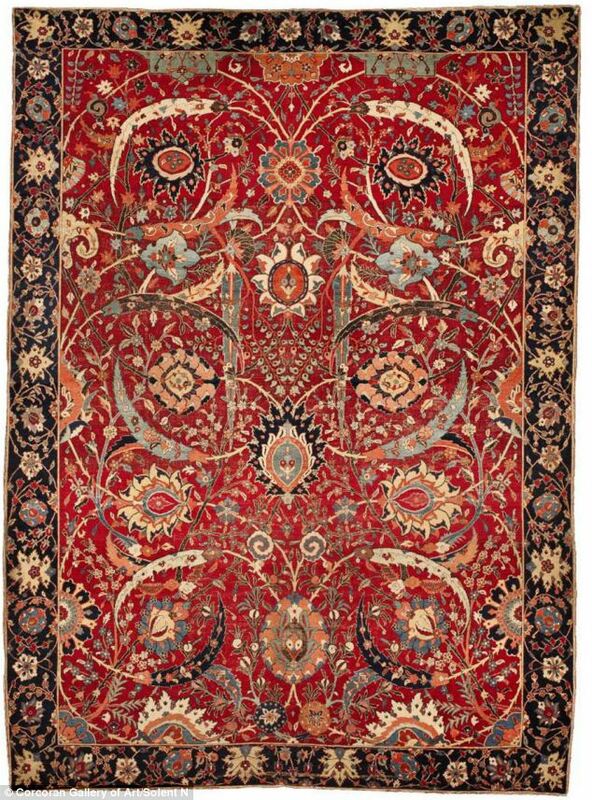 Carpet is being sold at Sotheby's (New York) in June to raise money for museum. Comfortable Design Is a Balancing Act. Rustic Splendor Shows How It's Done. 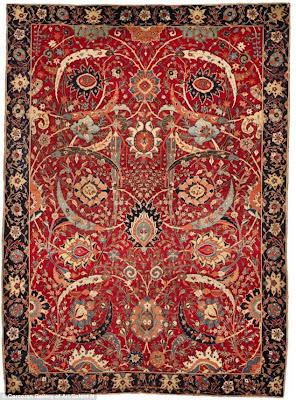 The subtle, understatement of the rug is a noncompetitive anchor and enhancement to the splendor of the room. Anyone could be comfortable relaxing away the entire day in this well designed room. Interior design is like tailoring: ‘Classic’ looks good forever! Following fashion fads is all well and good if you have the resources to be able to discard your clothes and buy a new wardrobe again each season. But for those who wish to spend their money wisely, classically tailored pieces in good fabrics are a far better investment. So too with your home. When I plan a scheme, I start by thinking about layout. I like to create social spaces, by grouping furniture in a way that encourages conversation and interaction, preferably around a focal point. (A piece of art, a stunning chandelier or a fireplace all make good focal points. Symmetry is also important as it creates a sense of balance and calm in the space. I then consider the key items that are the building blocks of the scheme; in a living room for example these would likely be sofas and armchairs. For these key items I choose classic styles that will stand the test of time – nothing too flamboyant. I recommend upholstering in colours chosen for longevity and to coordinate with the wall-color. And to anchor the furniture arrangement I use a large rug. 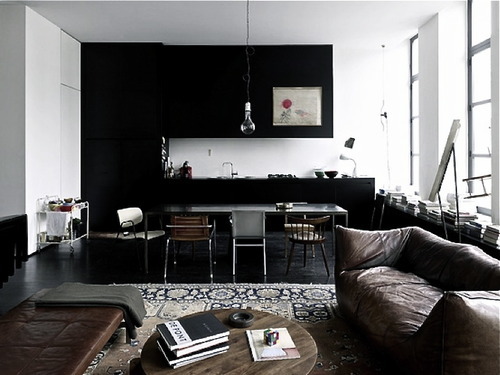 The rug is a great starting point for your colour scheme. I recommend choosing a multi-colour rug. This means that there is more than one colour which can be picked out in cushions, curtains and accessories and allows you to easily update your design scheme in the future. Oriental rugs are perfect for this providing a classic and timeless centre piece that wears well, tolerates family life and injects some warmth and personality in to your scheme. I believe that we should be surrounded by the things that we love and that make us smile so choose a rug that you fall in love with and will enjoy using for years to come. Picking out colours from your rug, (and here you can afford to be ‘on trend’ and select the colours that are most fashionable at the moment), find cushions, throws, bowls, vases and accessories that match your scheme. Sticking to these basic principals you can be sure to create a successful interior scheme. This interesting essay "Taste For Makers" (http://www.paulgraham.com/taste.html) by Paul Graham reveals the stuff it takes to make good stuff. It details concepts pertaining to what makes things beautiful, functional, useful and desirable. Fine rugs - especially traditional quality hand-knotted rugs - are all those things, and so must have these principles woven into their creation, and into our ultimate enjoyment of them.